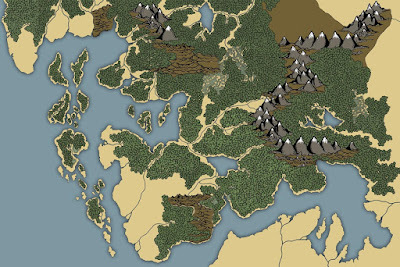 Everyone seems to have enjoyed the free map I posted a while back. It's made the rounds, been awesomed up and found a place in the Dragonsfoot forums. So I decided I may as well post another one. I was going for a kind of comic book style with this map. It was an experiment, mostly hand drawn on a wacom tablet in photoshop. It turned out pretty good. You could pretty easily use it for some northern wilderness setting thing, at least that's the vibe I was going for, but feel free to use it for whatever you want. If you use the map let me know. Both of the maps are free for anyone's personal use at the game table or for anyone's free DIY RPG products - I only ask for a link back or a credit as the maps creator. Several people have inquired whether they could my maps in their commercial (for profit) projects. The answer is: No, you cannot use these maps for any commercial project. Read the creative commons copyright below. 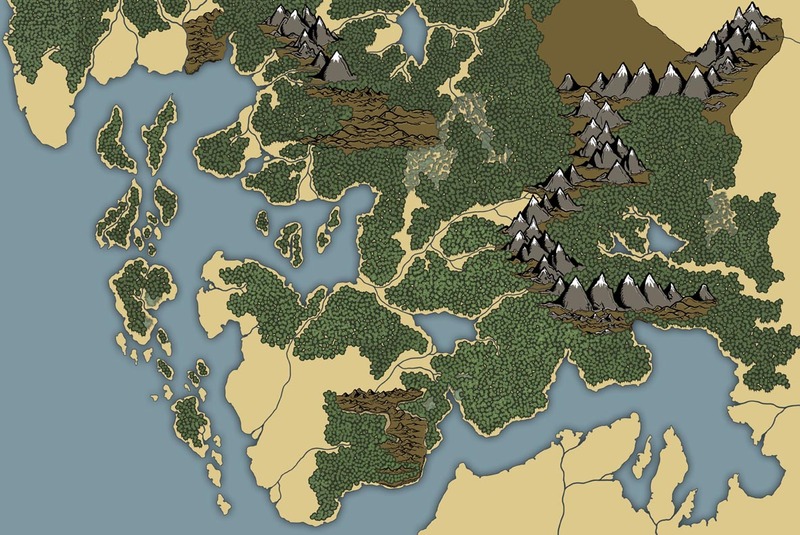 But, if you are a DIY RPG person, with little to no money, and really want to use one of the maps for something that you're working on, that might earn you a bit of money, let me know. We can talk, and if I like your thing, I will most likely let you use my maps for free. This work by John Williams is licensed under a Creative Commons Attribution-NonCommercial-ShareAlike 2.5 Canada License. You bring shame to me and my crude maps, Mr. Williams. SHAME. I do enjoy bringing shame to others, so thank you very much.